Identity fraud (IDF) is the fastest growing white-collar crime in many countries and specifically in developed countries. IDF is not a new phenomenal in human societies; the history of IDF can be traced back to hundreds of years ago. What has made it the center of attention in the past few years is the acceleration in the frequency and the impacts of IDF to individuals and businesses. One of the preliminary steps in managing IDF as a global phenomenon is to understand the scope of the problem and measure its different aspects. By realizing the importance of developing measurement systems in this area, and the recognition of a gap in this area of research, this study presents the previous approaches in developing IDF measurement systems, and uses them as benchmarks for developing and proposing a comprehensive measurement system for assessing IDF. Kumar, V, Kumar, U, Lavassani, Kayvan, & Movahedi, Bahar. (2007). 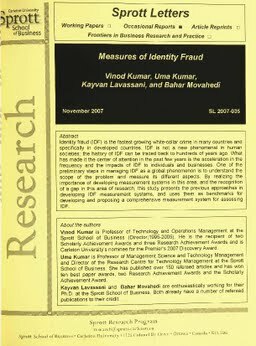 Measures of Identity Fraud. Sprott Letters, November(2007).